Q: How do I check the battery level of my earbuds? A: When the battery level drops below 10%, a voice guide will inform you of the battery level. 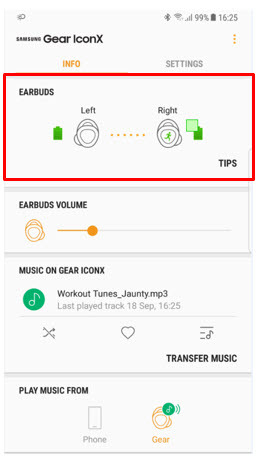 Or if earbuds connected to your mobile device, you can check it via Samsung Gear App. level will appear on the mobile device’s notification panel. exercise information to the mobile device. Then, charge the battery.